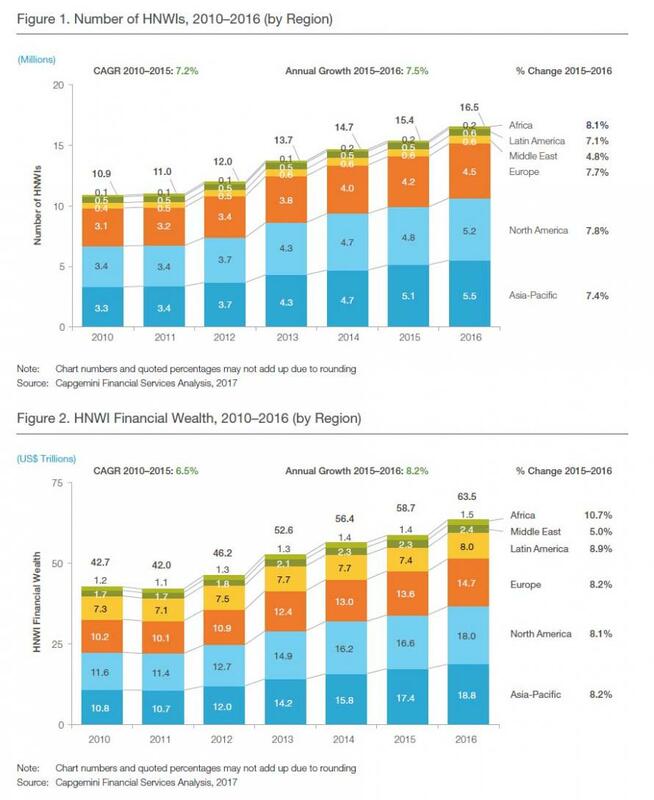 Last year, North America lost its status as the region with the highest number of millionaires and billionaires to the Asia-Pacific region - largely due to the rapidly rising inequality in nominally communist China. ...But even though China is rapidly catching up to the US in terms of the number of ultra-wealthy individuals (not to mention the exasperating breadth of wealth inequality), strong stock-market performance and rising real-estate valuations caused the ranks of American millionaires to expand by a solid 700,000, according to data from the Spectrum Group, via CNBC. According to Spectrum, the US now has more than 11 million millionaire households, up more than 6% from 2016. The number of new millionaires and the total population of millionaires set records. By Spectrum's definition, millionaire households are those with at least $1 million in investible assets - not including their primary residence. Of the factors that contributed to this rise, soaring equity values had perhaps the biggest impact. Excluding dividends, the S&P 500 climbed 19% last year. In an interesting twist, the impact of bitcoin's torrid rally (and subsequent crash) was conspicuously absent from the Spectrum Group report. Of course, this is hardly a new trend. To wit: the number of millionaire households has nearly doubled. In 2009, there were just under 6 million millionaire households. It's grown every year since, and is now well past the precrisis level of 9 million millionaires. As the old saying goes, "it takes money to make money." That's especially true for America's high net worth individuals. Because as Spectrum points out, the richer the individual, the more wealth they saw created this year. And barring an all-out stock-market collapse - which, if you listen to Bill Gross, Scott Minerd and handful of other investing luminaries is entirely within the realm of possibility - the wealthiest Americans are bound to see their wealth multiply again in 2018.